In addition to creating new jobs and improving the environment Green Banks are essential to ramping-up clean energy finance. Such banks are capable of helping to unleash the vast potential of climate focused investing. 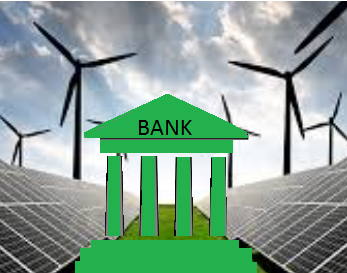 Green Banks reduce the cost of clean energy and efficiency. They are helping to change market thinking by taking a holistic, long-term view of industry support. A Green Bank is a government-created institution that facilitates private sector financing for clean technology projects. Different Green Banks have different programs, however, they all leverage public funds to attract private investment. In addition to providing capital and information these banks encourage private sector investments by helping to mitigate risk. They also help to standardize financial products to make them easier to buy and sell. The tools used by Green Banks include low-interest or longer-term loans, interest rate buydowns, project equity stakes, small grants, and, as the market develops, credit enhancements. 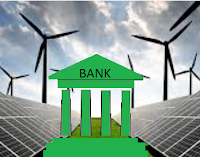 In the US there are a number of Green Banks including the New York City Energy Efficiency Corporation, the Connecticut Green Bank, the Hawaii GEMS Program and the New Jersey Energy Resiliency Bank. Internationally Green Banks include the UK Green Investment Bank, the Japanese Green Finance Organization, the Australian Clean Energy Finance Corporation, GreenTech Malaysia. For years we have watched Green Banks contribute to meaningful climate progress by supporting things like renewables and energy efficiency initiatives. The potential of green investment banking is huge, however governments can contribute to or detract from this laudable initiative. As reported by the Independent exactly one year ago, the government in the UK announced plans to sell off part of the first bank in the world established to make money out of environmentally sustainable projects. Launched by the government in 2012, the UK's Green Investment Bank will be privatized in a move that is expected to generate £1 billion. However, Chuka Umunna, the shadow business secretary, said the bank would be destroyed by privatisation. “It is unclear how the GIB can continue to perform its unique and vital function if it is sold off and it would be incredibly short-sighted if the important role it currently plays was lost,” he said. In 2014 the Green Investment Bank backed 22 new energy projects worth £2.5 billion and generating enough energy to power 4.2 million UK homes. As reported by Business Green in 2014, an investment Bank boss said that the UK's Green Investment Bank could mobilize £60 billion if government allows it. Banks are an important part of creating the necessary infrastructure to support the transition to a low carbon economy. One high profile example is EV charging stations. While electric vehicles are an important part of the transition, green banks can support charging infrastructure which is essential to the widespread adoption of EVs. As reported by Energy Manager Today, a study by the Center for Climate and Energy Solutions (C2ES) indicates that banks play a key role in the transition to a low carbon economy. This includes both expanding EV infrastructure and clean energy. As reported by Sustainable Business, the first "Green Bank Academy" was attended by leaders from over 11 states including California, Hawaii, Illinois, Kentucky, Maryland, Massachusetts, Minnesota, New Hampshire, Washington, NY and Connecticut. Green Banks can help fill the financing gap in the absence of government leadership. Mark Muro from the Brookings Institution, co-host of the Academy explained that Green Banks contribute to, "large-scale progress on big problems when the national government has gone absent." In 2014 US Green Banks committed to spending $15 billion on energy Projects over 5 years. This investment could be leveraged to over US $40 billion in private investments. Here is a brief review derived from an EDF article on the major Green Banks in the US. In 2012, Connecticut created the first green bank, known as Clean Energy Finance and Investment Authority or CEFIA. As reported by the EDF, CEFIA’s 2013 annual report indicates that for every dollar of ratepayer funds CEFIA invested, roughly $10 was invested by private sources. Much of this investment was focused on clean energy building upgrades that are part of Connecticut’s Property Assessed Clean Energy program. CEFIA also has an innovative financing solution for solar projects on commercial properties. In 2014 Connecticut's Green Bank (CEFIA), financed 1,160 projects and attracted over $180 million in private capital based on $41 million in state funds, resulting in 26.7 megawatts of new clean energy. New York has the largest green bank in the US, with $1 billion in funding. Launched in 2013, New York’s Green Bank focuses on advancing the clean energy market by encouraging business partnerships. Hawaii's Green Bank called GEMS launched in 2014 with a $150-million green bank called GEMS, that focuses on social justice. The program allows homeowners to finance solar projects that significantly reduce their power costs. In 2014 California introduced a Senate bill that laid the groundwork for attracting private capital for a green bank that launched in 2015. In 2014, Governor Chris Christie announced plans to launch an Energy Resilience Bank. Though technically not a green bank, the Energy Resilience Bank has proposed using federal Superstorm Sandy funds to finance the resiliency component of infrastructure projects that strengthen the state’s electricity grid during extreme weather events.